Sharks, rays and "glory" scuba days are possible in just a few areas of the Caribbean. The Turks & Caicos Islands offer just such an experience, as I confirmed recently when diving with Carol Potter, the dive shop manager at the Beaches Resort on Providenciales. We were at 70 feet swimming along a beautiful wall when she tugged on my fin to get my attention and pointed slowly to the trench on our left. I turned my head to see a beautiful spotted eagle ray moving slowly along beside us about 20 feet away. We slowed our swim along the wall and carefully watched the massive ray with 7 foot wing span continue its course paralleling us. We continued forward in amazement as the ray seemed oblivious to our presence beside the wall. Eagle rays are generally very shy and hard to approach. This one swam with us for a minute or so until a few other divers from our excursion appeared at the edge of the 70-foot deep wall above us. The noisy group didn't notice the huge eagle ray as it quickly moved off. The head dive master and I were diving a beautiful wall in Grace Bay off Providenciales, or "Provo" as it is commonly known, in the Turks and Caicos chain of islands. Eagle rays are occasional visitors to the chain and a few other islands in the Caribbean, but sightings are not common. South Caicos Island, which is slightly closer to Grand Turk, reportedly has schooling eagle rays on a regular basis, according to the dive master. It is a remote location that can be reached only by boat. The sight made my dive that morning, but I also had the fortune to have a very curious six-foot long Reef Shark circle Carol and I several times as we moved slowly along the wall at a 50 foot depth. My dive partner used her chalk board and wrote, "Curious Teen" on it after it moved by us and over us 8 or 10 times, passing just 20 feet away. We also spotted a Yellow Tail Moray and a giant 6-pound lobster in the coral rocks to highlight a wonderful dive experience. 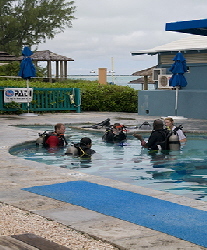 I was checking out the unique dive program offered by the Beaches Turks & Caicos Resort and Spa. The resort has one of the most comprehensive dive programs in the Caribbean and is located on one of the "top ten dive beaches in the world". Of most interest to certified divers is that resort guests can enjoy the "Luxury Included Vacation" with diving free of charge. Families and non-certified persons can take part in the resort dive courses and get certified, or for those with only a couple of days at the property, get qualified to do a shallow 30-foot dive with instructors. I spent just three days in the tiny country consisting of 40 small islands in the Atlantic just north of Haiti. Its main island of Provo is a favorite travel destination of mine, as I have been there several times and actually, from my extensive diving around the Caribbean and Pacific, have called the island the "world's best snorkeling spot". 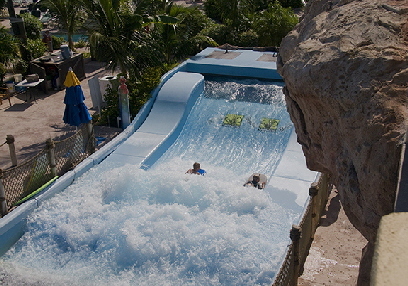 One program of interest to divers at Beaches Turks & Caicos Resort Villages and Spa is the "Live It Up 'n Dive" months taking place each year in September and October. 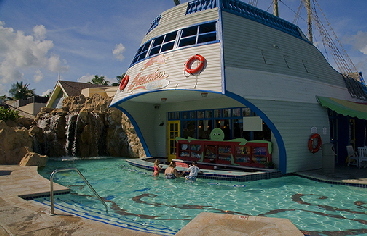 There is special pricing on the comfortable suites and plenty of activities such as cocktail pool parties, a dive treasure hunt, beach bonfire, etc. There are 16 specialty dining options to "fuel up on" at the meal times. The resort is made up of 3 distinct villages, the Caribbean, the French, and my favorite, the Italian. There are 6 pools, a giant water park, and 614 rooms and suites spread out over 65 acres adjacent the island's most beautiful white powder beach. The concierge services and amenities are extensive for a family vacation that won't be forgotten. 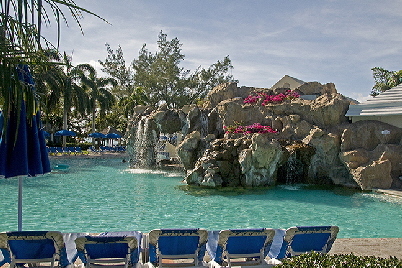 For more information on Beaches Turks & Caicos Resort & Spa's beautiful luxury beachfront accommodations and diving packages, contact btcmail@grp.sandals.com, phone 649-946-8000 or visit their website at www.beaches.com.